Darling Man and I have been hard at work eating our way through Ho Chi Minh City’s vegetarian options. We wanted to include a vegetarian street food tour in our new business, Saigon Street Eats, because we have met so many travellers who don’t eat meat. Vietnam, as a predominantly Buddhist country, does cater for vegetarians. Many people forgo meat on one day a month, a habit that is as much for health reasons as it is for religious regions. The problem for visitors is that vegetarian food can be difficult to spot. 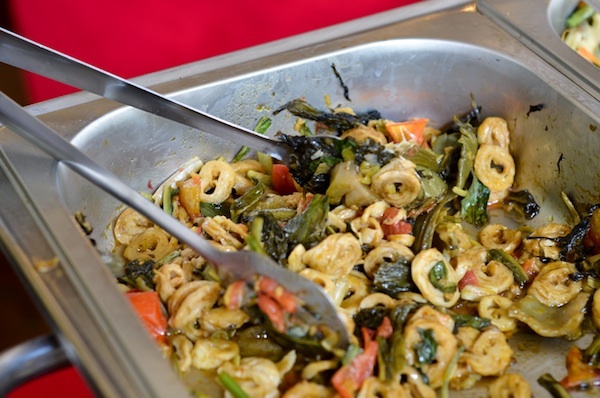 The words you need to look out for are cơm chay or simply chay. If you are vegetarian, don’t think you can swan into any old restaurant in Vietnam and order tofu. 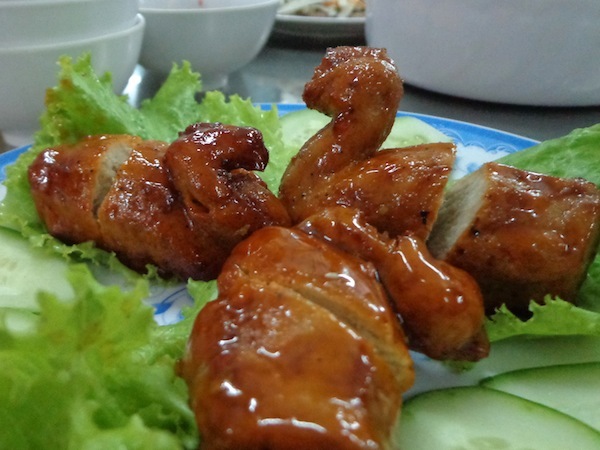 You are likely to find it garnished with prawns or stuffed with pork – tofu is not strictly for vegetarians here! 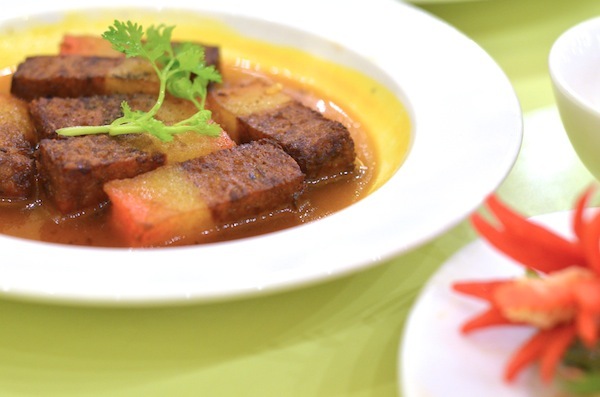 One of Saigon’s best vegetarian restaurants is Hoa Dang, also known as Loving Hut, which serves vegan food. Darling Man, who, like me, was a vegetarian for a while when he was younger, says the fake meat phenomenon is relatively new in Vietnam. He says fake meat corrupts the concept of forgoing meat. The fake meat can look very real, like the fake stewed pork dish. Or it can look ridiculously fake, like these quail-shaped lumps of tofu. I felt so sorry for the fake quail with the broken neck. And then there’s the times that you’re better of not knowing what is being faked. Things like the sliced up brownish lump that I was enjoying until Darling Man told me it was fake kidney. And the ear-like things in a vinegar-y sauce that he told me was fake intestines. The words he used, though, was “large gut”. Ewww. Our conclusion after trying all kinds of weird and whacky fake meats: some are way better than meat and some are a bit meh. The good fake meat includes the fake Peking duck, fake stewed pork and fake fermented pork. And the quail-shaped tofu was definitely in the meh category, even though they were so cute! It’s been heaps of fun sorting the good from the meh. However, I now think I need a treadmill. I need to do my writing while walking because all this food research is having consequences. If you know what I mean. As long as the consequences are a fat bum and not 200 visits to the toilet within an hour then continue on I say!! Love the look of that fake pork. And the poor tofu quails – complete with broken necks – are hysterically funny to me for some reason! Tracey – Life Changing Year recently posted..Hello Egypt! I Think I Love You! And Your Menfolk! Tracey, in five years in Asia I’ve only had the 200-toilet-visits problem once or twice and I don’t think it was what I ate, rather it was what I touched and then touched my mouth. Darling Man is much more prone to what he calls “dancing stomach” and that’s because he can’t handle dairy. i’m grossed out by that last one!!! do they use chicken broth or anything, in their veggie dishes? wandering educators recently posted..Why Teach Internationally? No, as far as I know everything that we ate was 100% vegan. Hey if it tastes good who cares if it`s not meat! Extremely happy to see a post on vegetarian options in Saigon and waiting to try some through Saigon Street Eats! Have a great Tet, will be in touch for a veggie chow out after the holidays.